Find printable information sheets here. Delineate the bed shape by using a garden hose to create the bed outline. When you are satisﬁed, mark the bed shape using inverted marking paint. To eliminate any existing grass, spray the bed area with a quality herbicide like Roundup. Wait about a week before tilling. Sometimes a second application may be necessary, depending on the type of grass. Before tilling, cut a smooth edge around the bed area using a ﬂat spade or a bed-edger. The edge should be in the shape of a “V”, about 3-4 inches deep, angled away from the lawn area. When you are ready to till the bed areas, simply spread the soil conditioner and topsoil (if you use it) evenly over the area to be tilled. Then till everything in at one time. Till thoroughly, but don't till around shallow-rooted trees such as dogwoods or Japanese maples, since root damage can lead to potential problems with your trees. If you need to add topsoil to your bed areas choose sandy, loamy topsoil that will aid in good drainage. To build the bed up by three inches, add topsoil at a rate of one cubic yard per 100 square feet. Shrubs, trees, perennials, and annuals can be fed Tree and Shrub Fertilizer, Plant Tone, or Dynamite. These slow-release fertilizers are better for your plants because they release nitrogen slowly over a period of several months. This creates healthier plants and a healthier environment, by preventing excess nitrogen from washing into our waterways. To finish all your beds with a professional touch, try this trick. Mulch the bed with pine needles, allowing the needles to extend over the “V” edge you made with the spade before tilling. After mulch has been spread, simply tuck the needles into the “V” with the spade. This technique will give you a neat, professional look. Other mulches can be used to achieve the same finished look. Mulching has become increasingly popular in our area because of the finished, manicured appearance it provides in the landscape as well as the plant health and weed control benefits it offers Shredded hardwood mulch, pine needles, and mini-nuggets are all popular and pretty much equally effective. The mulch for you largely depends upon personal taste and where you're planning to use it. In addition to providing that "finished landscape" look, mulches provide many benefits to plant growth and reduce the demand for landscape maintenance. Mulches help to conserve soil moisture by reducing evaporation—thus reducing the need for irrigation and watering. They also modify soil temperatures in our extreme seasons of hot and cold—lowering soil temperatures in summer, favoring root growth and insulating soils in winter, protecting roots from cold damage. A good layer of mulch is also very effective in preventing weed growth, limiting the germination of weed seeds and inhibiting their growth. When organic mulches decompose, they provide nutrients and add humus to our soils, both improving soil texture and promoting more vigorous plant growth. Mulch also helps to protect tender root systems, cushioning the effects of heavy rains and foot or vehicular traffic, which can cause excessive compaction of both soils and roots. In addition, mulching rings around trees and mulched planting beds naturally prevent physical injuries to landscape plants caused by lawnmowers and mechanical trimmers—injuries which often contribute to the early decline or death of even established plantings. Most mulches should be applied to a depth of two to three inches and maintained at a depth of less than four inches. Annual top dressings may be necessary to maintain that "freshly-finished" look, however, keep in mind that the less you add to an established area the better. When mulching around the base of plants, do not mulch up against the trunks of trees or shrubs. Start mulching just beyond the trunk and gradually taper up to the two to three inches as you get away from the plants. This will prevent excess moisture around the base of the plants which can lead to suffocation and rotting of the roots. Avoid freshly ground sawdust, tree-chippings and any other organic matter that has not been aged or composted. In the process of decomposition these materials will take oxygen and nutrients from the soil and can literally starve nearby plants to death. Mulch can be applied at any time of the year, but the most effective times are early spring (before the leaves open) and in the late fall after we have had several frosts. Avoid mulching in late summer- early fall because mulching at this time can keep soil temperatures too high for plants to harden off. Proper pruning is the most important task you can undertake to have healthy, long-lived trees and shrubs. 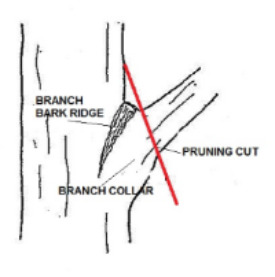 Proper pruning involves when to prune, what to prune, how to prune, and if to prune. Shrubs that form flowers on wood grown the same season should be pruned when the plant is dormant. Water sprouts are the rapidly growing, thick, soft shoots that appear after a tree suffers an abrupt, major change. They commonly appear after heavy pruning. They are not, however, strongly attached branches and rarely make good substitutes for the slower growing existing branches. Usually, water sprouts that do not fill a hole in the tree's framework are removed. Thin out up to 1/3 of existing limbs to allow light into center of the plant to promote new growth on the interior branches. Allow at least 1 year for the interior foliage to form before reducing size of remaining outer limbs. Make severe size reduction all at once, this works well on many large-leaf hollies, azaleas, ligustrum. For older shrubs, thin out oldest, woodiest canes, up to 1/3 of total canes yearly to encourage new basal growth. Prune back prior to spring growth, or when plants no longer have "winter interest". Cut plants 2-3" above ground level. Time-saving tip: With a length of rope, tie up grasses 1'-2' above ground level. This enables grass to be cut more easily by pulling the stems tightly together. Once cut, all the stems are bundled for easy disposal. These plants bloom on last year's wood and set flower buds 1-2 months after blooming. To avoid pruning off next year's flowers prune as soon as possible after blooms fade. These plants bloom on new growth-prune immediately after flowering or before growth begins in spring. Remove twiggy branches smaller than a little finger back to the connecting branch. Head back twiggy tips to the point they are a little-finger in diameter. Remove crossing branches from the interior. Do not head them to the main trunk. It is a common, but incorrect pruning method for Crape Myrtles. Amelanchier (shadbush): Prune only to shape, as either bush or tree. Carpinus betulus (European hombeam): Prune to tree form. Carpinus orientalis (Oriental hornbeam): Prune to tree form. Cassia ﬁstula (golden-shower, senna): Cut back season‘s growth to short spurs after blooming. Cercis (redbud): Prune after blooming if necessary. Cornus ﬂorida, Cornus Kousa (ﬂowering dogwood, Kousa dogwood): Prune as little as possible; heals slowly. Cotinus obovatus (American smoke tree): Prune to grow as bush or small tree; cut off fading ﬂowers. Elaeagnus (Russian olive): Prune only to control size, if necessary, in late winter. Euonymous atropurpurea (burning bush): Prune in late winter, only if necessary. Franklinia alatamaha (Franklin tree): Prune to tree form. Halesia monticola (silver-bell): Needs pruning rarely. Hydrangea paniculata 'Grandiﬂora' (peegee hydrangea): Prune in late winter. Loelreuteria paniculata (golden rain tree): Prune to shape when young. Labumum anagyroides (golden chain): Prune after blooming. Magnolia (magnolia): Prune just after blooming. Mulus (ﬂowering crab apple): Prune to shape, renew old wood if necessary. Myrica cerifera (wax myrtle): Prune to remove winter injury, or to shape, in late winter. Myrica pensylvanica (bayberry): Prune to remove suckers, winter injury. Oxydendiym arboreum (sourwood): Needs pruning early. Prunus (ﬂowering almond, apricot, cherry, peach, plum): Prune to shape in late winter. Rhamnus davurica (buckthom): Prune to shape in late winter. Sorbus (mountain ash): Prune to tree form in late winter. Symplocos paniculata (sweetleaf, sapphire-berry): Prune to shape, renew old branches. Syringa reticulata (Japanese tree lilac): Prune right after blooming, if necessary. Viburnum (cranberry bush, nannyberry, black haw): Prune in late winter only, as necessary. Trees: To Prune or not to Prune? Dead Limbs-Easiest to detect during growing season when leaves are present-or should be. Diseased or Insect Damaged-These need to be removed at least 1’ past the point of infection, or to the proper length for the shape of the tree, whichever is greater. In the Way-Limbs touching the house or that causes you to duck to mow under. Limbs that Cross-These are limbs that rub against each other. Choose the strongest and best located one for the overall shape of the tree. Prune to the natural shape of the tree-forcing it into an unnatural shape (or size) means more pruning! Never top any tree for any reason. It is unsafe and unsightly. 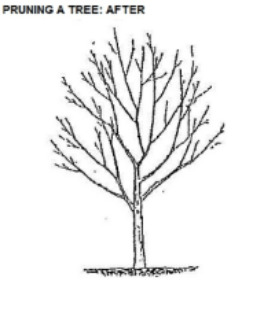 Trees can be pruned almost any time except during spring bud break or leaf expansion. Prune flowering trees 2-3 weeks after blooming to prevent cutting off next year’s flowers. Typical needs of an unpruned tree: crowded foliage, asymmetrical shape, broken and diseased branches. Other reasons for pruning include controlling size and increasing the amount of sunlight to a window or to plants in the shade of the tree. If you regularly prune to remove broken, diseased, crossing and asymmetrical (or out-of-place) branches, then you will reduce future problems and have a healthy, attractive tree. Do you Need to Prune? Just because it’s "x" month doesn’t mean you have to go prune your __ shrub. Is it healthy and growing well? Is it a good size for its surroundings, with room to grow? Not growing into the house? Does the shape allow for light and air to penetrate to the interior? Maybe you don’t need to prune this year. What if the job is too big for you, a big tree for instance? Large pruning projects on trees require equipment and special training-a professional tree service. Ask them to top your trees. If they don’t try to talk you out of it or refuse to do it, they are not a quality company. Are they are insured and bonded? Ask for references. How will they access the tree? Unless the tree is to be removed, climbing spikes or gaffs should not be used on a live tree as it can cause severe damage. A rope system should be used instead. Prepare site by digging hole twice the width and for trees & shrubs, not quite as deep as root ball. For perennials plant level w/ surrounding soil. Remove plant from pot and loosen roots well. If Balled and Burlap (B&B) remove all strings or strapping and cut burlap off the top of the plant. Any wires from the B&B basket sticking up can be bent down into the hole. Amend excavated soil w/ compost or soil conditioner (1:4 ratio) and BioTone (follow package directions based on plant size). Backfill, avoiding air pockets. Do not cover top of root ball at this point. Apply 2-3" of good quality mulch, keeping mulch from contacting trunk or stem of the plant. Water well using a slow trickle so root ball is thoroughly soaked. Water as above about every 3 days for the first two weeks (less if it has rained significantly, possibly more if drought conditions), then water the equivalent to 1" of rain per week. For most plants, thorough watering weekly is preferable to light surface watering more frequently. Exceptions are shallow rooted plants such as dogwood, Japanese maples, azalea & rhododendron. Overwatering as just as detrimental as under watering, and symptoms are similar. Monitor automatic irrigation systems closely to avoid both situations. New plantings need water in fall and winter also, but usually only half the amount needed in spring/summer. Before you resort to drastic measures, read these words of advice from Scott R. Craven, Extension Wildlife Specialist of the University of Wisconsin, in Madison. It is possible to "peacefully coexist" with rabbits. How do you spot rabbit damage? lt’s cleanly cut rather than torn away. Deer damage, on the other hand, has a jagged appearance. Eastern cottontail rabbits feed just before sunrise and just after sunset, but they may also be active during the day. The Eastern Cottontail is the most common type of rabbit in this area. Rabbits like to eat a variety of plants, especially those that are young, tender, and green. Many customers complain of rabbits eating their pansies, petunias, clematis, lettuce, and phlox. There are a few plants which have been said to repel rabbits, but we haven't found solid research to back up that claim. These plants include rosemary, dusty miller, marigolds, daffodils, lemon grass, garlic, peppers, and ornamental strawberries. lt may be worth a try to edge your area with some of these plants. If you want more reliable results in warding off rabbits, read on . . .
For best results, repellents are most effective before damage occurs or at the first sign of damage. There are several types of repellents to discourage rabbit browsing. Among these are chemical repellents like organic "I Must Garden" Rabbit Repellent. Their residual effects work a little longer than those of odor or taste repellents. Most rabbit repellents are taste repellents or contact repellents, which make the treated plant distasteful to the rabbit. These repellents, such as Hot Pepper Wax spray, protect only the part of the plant they contact; new growth that emerges after application may not be protected. Heavy rains may necessitate reapplication of some repellents. Taste repellents are usually more effective than odor repellents. The degree of effectiveness, however, is highly variable, depending on the behavior and number of rabbits and alternative food sources available to them. 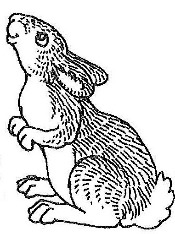 When rabbits are abundant and hungry, use other control techniques along with chemical repellents. You can reduce the rabbits' habitat by removing brush piles, weed patches, dumps, stone piles, and other debris. Vegetation control along ditch banks and fence rows should help. Family pets, such as dogs and cats, may also help. Trapping is the best way to remove rabbits. The first step is to get a well-designed and well-built live trap. Several excellent styles of commercial traps are available. Most are made of wire and last indefinitely with proper care. Live trapping with a "Havahart" trap is an effective method for removing rabbits. The traps should be baited with apple slices and set in dense, brushy areas. The captured animals should be transported at least five miles away from the trapping site to discourage their return.